Well let's just say Klout and I haven't found much common ground at the moment, I use it because I understand it's important for your tots score and although I know that's not the be all or end all of blogging I would like to see myself at least in top 500 before the end of the summer. So I persevere with it, but we've not quite hit it off yet! I'm half expecting all of these things to be possible, but I'll be darned if I can find out! It's not a huge list for this one as I quite honestly have NO idea what I'm doing! 1. Please let me k+ from the app (not just the desktop!). 2. Please let me follow people I regularly k+ so I don't have to search each time. 3. Please display all my Instagram photos, apparently you use them all in your algorithm's so kindly display them. 5. Please suggest things in my feed that I'm interested in. 6. Please make it easier to find things I'm interested in. 7. Please tell me why my score is going down, despite increased activity! Please do leave me a comment if you know how to do any of the above, I'd love to be proved wrong and be able to use it! You're right though - the app is completely worthless as far as I can see and it's a pain in the arse to try and find people to give +K! 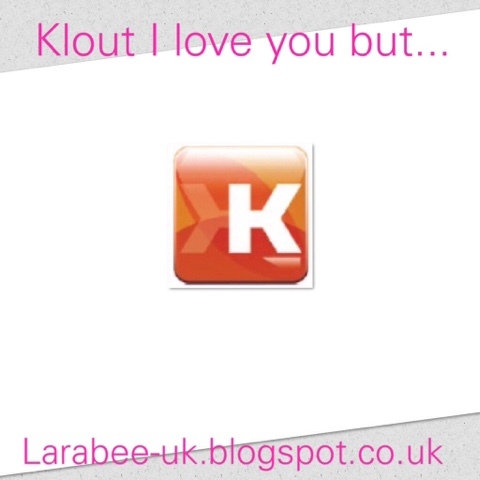 Do blog about it if Klout ever answers you!